James Daniels is terrified of heights. But the NC State College of Education middle grades major wanted to encourage Cristofer, a middle schooler he mentors, to try new things. So when Cristofer asked to go on a thrill ride at the North Carolina State Fair in October, Daniels responded without missing a beat. SAY Village residents are mostly freshmen and sophomores fulfilling their on-campus residency requirement; however, the program is open to all students at NC State. First-year SAY Village residents are paired with elementary students while returning residents and mentors work with students in middle or high school through extended programs Determine Area Youth (DAY) and Linking Empowering Avoiding Dropout (LEAD). Daniels and Cristofer met in August through the Students Advocating for Youth (SAY) Village — a living and learning village that connects NC State University students with underserved K-12 students in the Wake County Public School System for after-school mentoring. 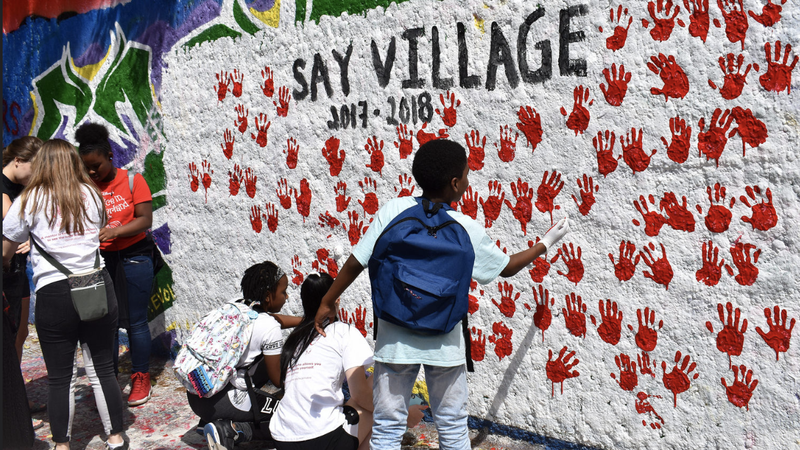 SAY Village is affiliated with the NC State College of Education and is one of 15 living and learning villages available to NC State’s residential students. Daniels said he considered a living and learning village for his first year on campus because he wanted to live on campus with purpose. When he saw SAY Village provided mentoring experience with kids, he applied right away. SAY Village residents — who do not have to be an education major to participate — live in historic Syme Hall, a premium residence building in the heart of campus. 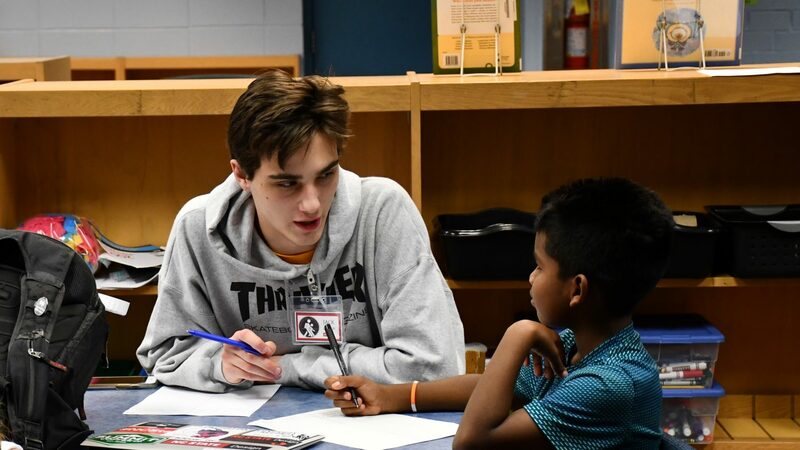 Residents provide one-on-one mentoring to students who need more positive and productive interactions at five area schools — three elementary schools, a middle school and a high school — once a week. McWilliams has led the program since its early days, signing on to pursue his passion for helping college students succeed while indirectly working with school-aged children. Along with his team, he recruits the residents of SAY Village and oversees the training and programming provided to the residents as they begin their mentoring relationships. Director Robin McWilliams and Assistant Director Lindsey Hubbard go to great lengths to ensure the residents of SAY Village are prepared for both positive and challenging encounters as a mentor. They provide workshops twice a month about topics like transitioning into college, issues in youth advocacy, exploring diversity and multiculturalism, and self-care during stressful events like final exams. They also offer opportunities to relax and have fun in Syme Hall at game nights, lip sync battles and impromptu ice cream parties. SAY Village also offers opportunities for professional development through poster presentations at the National Youth-at-Risk Conference in Savannah, Georgia, and visiting youth advocates in Washington, D.C. Through these opportunities, residents cultivate new mentoring skills that in turn help them make a greater impact on the students assigned to the program. Helping students is exactly why Zach Carr, a first-year science education major at the college, joined SAY Village. He wanted to be surrounded by students, like himself, who aspire to make a difference through student mentoring. Lindsey Hubbard, assistant director of SAY Village and a doctoral student in the NC State College of Education’s educational psychology program, says the weekly hour-long sessions can be about whatever the mentee wants it to be. Mentees can play outside, catch up on homework, try new science experiments or simply talk about their day. The end goal is to help them feel supported and valued in a safe environment. 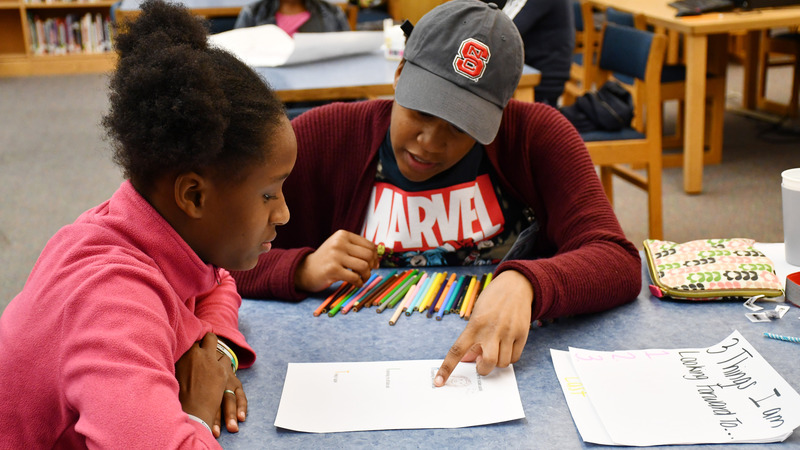 NC State Education freshman Sydney Reid works with her mentee during an after-school mentoring session. Freshman Sydney Reid says being part of a living and learning village was the best decision she made after accepting admission to the college’s elementary education program. McWilliams and his team also plan signature events for all of its residents and mentees to attend — including a field day on NC State’s campus complete with bouncy houses and painting the university’s Free Expression Tunnel and a trip to the North Carolina State Fair. That trip to the North Carolina State Fair — and it’s terrifying thrill rides — made all the difference in Daniels’ mentoring relationship this year. The trip helped him understand what kind of support and attention his mentee needed from him: a friend who would engage in conversation and try new things. Participating in living and learning villages like SAY Village requires an application and admissions process. The cost is included as a normal University Housing charge.